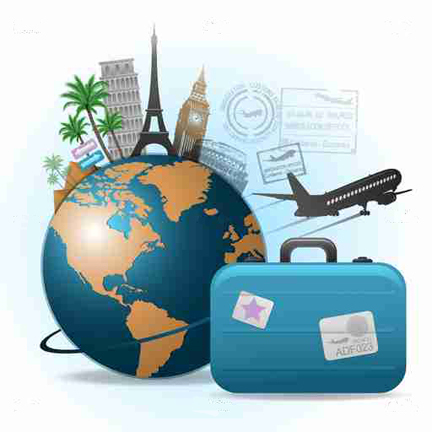 Wherever life’s travels take you this summer, bring along your essential oils in a travel pocket inhaler/diffuser. Whether you need to stay energized and focused, or just winding down at the end of a long day of travel, here’s a few inspirational blends to take along. I’m continually asked – What are pocket inhaler-diffusers? A simple way to carry your personal scent, favorite essential oil or blend. Just 3 ½ inches long, it slips easily into your pocket, purse or gym bag for all your travels and holds its scent for months. Just remove cap and inhale. 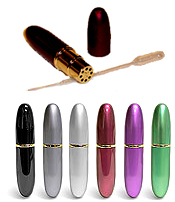 The first set of pocket inhalers above have a “sealed” bottom compartment to add your own blends and personal scents. 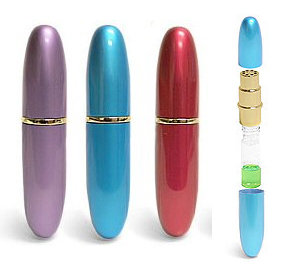 Add 8-15 drops of your Essential Oils into the holes at the top using the specially designed eyedropper included. There is a glass bottle with cotton inside that holds the essential oil. Refresh with your essential oils using the dropper as necessary. The three colors above have a removable glass bottle. Add 8-15 drops of a single essential oil or your favorite blend to a cotton pad, insert in the glass and screw into the metal cap. To change the scent, just remove cotton pad and insert a new one. Refresh with your essential oils anytime. ■ 8 drops Lemon ■ 5 drops Sweet Basil ■ 4 drops Bay Rum. Mix essential oils and add to pocket inhaler-diffuser. ■ 6 drops Lime ■ 2 drops Rosemary ■ 2 drops Peppermint ■ 2 drops Lavender ■ 2 drops Geranium. Mix essential oils and add to pocket inhaler-diffuser. ■ 5 drops Rosewood ■ 1 drop Ylang Ylang ■ 1 drop Bergamot ■ 1 drop Vanilla Absolute. Add oils to a warm bath/shower area, or warm foot bath at the end of your day. Relax 15-20 minutes. This entry was posted in Diffuser Blends, General. Bookmark the permalink. Thank you for this post. The pocket size diffusers/inhalers are a great idea when you’re on the go, especially if you can’t necessarily carry all your oils with you. Great blends as well!